Udupi, Dec 03, 2015: Production of mattu gulla, the famous brinjal variety in the region, has fallen prey to pest attacks, raising doubts about its availability during the paryaya held once every two years. Sudhakar D Amin, president of Mattu Gulla Growers’ Association, is hopeful of supplying sufficient quantity required for the paryaya, as they have started growing another batch. It is a tradition that mattu gulla growers offer their yield as per their capacity for mass feeding on the day of Paryaya Mahothsav of Sri Krishna Mutt, and paryaya celebrations are incomplete without the delicacies prepared out of this brinjal/eggplant. Pejawar seer Vishwesha Tirtha will ascend the paryaya Peetha for the fifth time on January 18. Since the biennial paryaya system began in 1522, no seer of the Udupi Ashta Maths has ascended the peetha more than four times.Legend has it that about 400 years ago, Sri Vadiraja of Sri Sode Mutt blessed the farmers in the region by offering the seeds of this brinjal variety. Farmers offer ’hore kanike’ of the mattu gulla in a ceremonial procession on Madhva Navami, and this tradition has been going on for over 500 years. 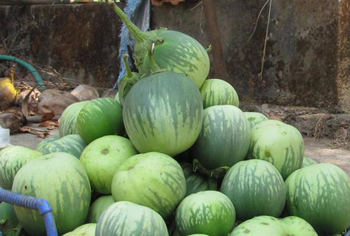 The first mattu gulla crop has seen fruit and shoot borer problem. But Udupi horticulture officials stated that the disease, endemic to this crop, will not result in a total loss of the crop unless the farmers neglect the attack initially. Moreover, the second mattu gulla crop grown in December after paddy harvest in the second week of January is used in ’hore kaanike,’ the official said. According to the department of horticulture, the crop is grown in 67 hectares. The yield is about 40 tonnes per hectare. " Last year, due to ingress of saline on 21 acres, the crop was lost," the official said. Udupi is famous for Mattu Gulla, When it is cooked with the masala wow the taste is completely different from the other brinjals which is sold in the market.